Where Is Your Coffee Better: At Home or the Office? Coffee is the fuel that drives America – at least where human production is concerned. We drink coffee at home, at the office, down at the local coffee shop, and in the restaurants that we dine in every evening. It is fascinating to listen to people talk about their opinions on coffee. For example, where is your coffee better: at home or at the office? brewing method (drip, steam, press, etc.). So, there are several different ways to decide where your coffee is best. If your choice is primarily based on the quality of your drink, then home brew is probably your preference. There is a simple reason for this: making coffee at home gives you absolute control over every aspect of your brew. Another thing to consider is that coffee made at the office might sit around for hours before you get to it. If you prefer fresh, you are going to appreciate home-brewed coffee more. You might feel that coffee is better if it is quick and convenient to procure. In that case, your office coffee is probably your best choice. Unless you are the one tasked with keeping the coffee flowing, your only responsibility is to saunter up to the coffee machine and pour yourself a cup. Somebody else handles making it and cleaning up the mess. Of course, the convenience factor is erased if you have single-cup brewers both at home and the office. Then it is the same process either way. The advantage you have at the office is not having to order supplies or clean up at the end of the day. It should be obvious that both home brew and office coffee have their advantages. You may prefer coffee at home because you are able to curl up with a good book or sit out on the patio and enjoy a cup while you’re watching the sun come up. You certainly cannot replicate those experiences in the office. On the other hand, your office might offer certain coffee choices you do not have at home. There is no need for you to purchase 10 different flavors at home because you can get them at work. That would certainly be an advantage to enjoying most of your coffee during the work day. We know there is no right answer for every coffee drinker. Nonetheless, we are here to serve your office with the finest coffee and beverage service in the greater New York area. We invite you to look through our entire inventory of products and equipment at your leisure. If you are ready to take your break room to the next level, give Galaxie Coffee a shout. Your company has a very valuable asset in the break room. That’s right, your break room can be used as more than just a home for the coffee machine and water cooler. It can be a tool for engaging with your staff. We aim to explain how in this post. Note that you might not be able to utilize all the suggestions you read here. You may be restricted by available space, your budget, and other things. The point is still the same, though: use your break room to whatever extent you can as a way to engage with your staff. You will all be the better for it. If you have to choose between a conference room and the break room for team meetings, choose the break room. The break room offers a more casual environment that will put team members at ease. When staff are at ease, they tend to be more willing to collaborate. They are more willing to share their ideas and voice their concerns. As an added benefit, conducting meetings in the break room means you do not have to carry coffee pots to the conference room. You don’t have to worry about getting that beautiful conference room table dirty, either. If your company is large enough, consider adding a video monitor or two to the break room. Video monitors can be hooked to a computer network and used to display important company messages. In between messages, stream the weather report and local news. Video messaging is a terrific way to keep staff members in the loop about all sorts of important things. Whether you are having a meeting or workers are taking lunch, nothing will put them more at ease than comfortable furniture. Big tables and plastic chairs have long since lost their luster. Take them out and replace them with furniture that is more conducive to socialization and conversation. Think the local coffee shop here. Far too many break rooms are cold, impersonal environments that serve only a utilitarian purpose. You can better engage with your staff by personalizing the environment. Put up some interesting pictures accompanied by a few discrete decorations here and there. Even a plant or two would be nice. The goal is to make the break room more like home than the office. We recommend tying all your engagement efforts together with free snacks and beverages. Studies have shown that this one perk can boost employee satisfaction considerably. Why does this matter? Because satisfied employees are more likely to engage with management and ownership. Galaxie Coffee has everything you need to stock your break room. We invite you to browse our inventory and then contact us with any questions you have. We would be happy to service your office with a full selection of beverages, snacks, and break room supplies. A 2015 survey conducted by a grocery delivery chain and published by USA Today showed that employers can create a more positive vibe at work by providing free snacks and beverages. In fact, the survey of 1,000 full-time workers revealed that worker satisfaction jumped from an average of 56% to 67% when workers enjoyed free snacks. That says a lot. Today though, just any old snacks will not necessarily do. Our collective consciousness about healthier eating has employees looking for things other than candy bars and potato chips. They want healthy snacks and drinks they can feel good about consuming. A growing number of offices are beginning to stock their refrigerators with fresh fruits and vegetables. 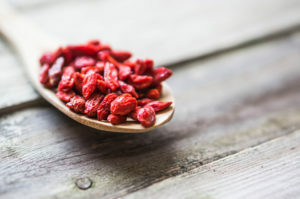 These kinds of snacks do not come easily packed in a vending machine, but it is well worth the effort to procure things like apples, oranges, grapes, strawberries and blueberries. Fresh fruits pair very well with healthy beverages. People seem to love just about anything labeled ‘organic’. Such a label does not necessarily mean what consumers think it means, but that doesn’t change the fact that people are interested in products like organic veggie chips, energy bars, etc. Anything organic is likely to do well in the break room. One of the big dangers of snacking is not controlling your portions. For example, one candy bar per week won’t do you any harm. One per day is another matter. So to address the portion control question, we are now seeing producers putting forth the effort to make it known they are controlling portions by way of their packaging. Consumers are responding favorably. 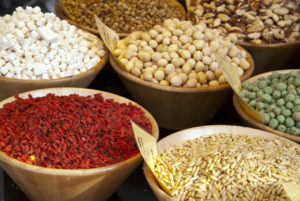 In terms of actual snack foods, two of the hottest trends right now are seeds and nuts. People are suddenly being turned on to snacks like pumpkin and sunflower seeds. They are also showing an affinity for almonds, pecans, and walnuts. Even peanuts (they are really a legume by the way) are hot right now. Last on our list is the emerging trend of replacing sugary drinks with healthier alternatives. At the top of the list are a variety of flavored seltzers, which is the fastest growing soft drink category. Also, teas that include dandelion and green tea are popular. Beyond tea are flavored waters like lemon and coconut water. It should be noted that these flavored waters utilize natural flavorings. Natural fruit drinks with no extra sugar added are another great option. People are drinking more blueberry, tart cherry, and apple juice than they have in a long time. We love healthy snacks here at Galaxie Coffee. We invite you to check out our entire healthy snack inventory. From fresh fruit to veggie chips, we can stock your breakroom with plenty of great stuff. And don’t forget our coffee service either! Which Cookies Go Best with Coffee? Coffee is a beverage that pairs well with a lot of foods. Some people like coffee and donuts; others like to pair their favorite brew with a bread or cake. Our personal preference at Galaxie Coffee is the simple cookie. It doesn’t get much better than a hot cup of joe and a good cookie. The question is, which cookies go best with coffee? That depends on your personal preferences. We have ours, and we are not shy about talking about them. We want to offer you two runners-up along with the cookie we believe goes best with coffee. We will begin with shortbread as the second runner-up. 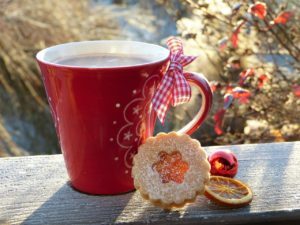 A good shortbread cookie has just enough flavor to stand out on its own without detracting from the taste of the coffee. Put the two together and you have a great combination. The one downside to shortbread is that it can be crumbly. It doesn’t dunk well as a result. As a sweet treat, brownies are always good. They pair well with coffee on their own. But a brownie-style cookie is even better. Brownie-style cookies offer you the same rich, chocolaty flavor of a regular brownie but in a pastry that is more firm and crisp. Brownie-style cookies are great for dunking or eating dry. For our money, biscotti is clearly the best cookie for pairing with coffee. Biscotti is an Italian biscuit made from a very simple recipe that includes flour, sugar, eggs, and either almonds or pine nuts. It is the nuts that give biscotti its signature flavor. A good biscotti is a firm, crunchy cookie that is relatively dry compared to the more moist shortbread and brownie cookies. A lot of people enjoy biscotti all on its own. But when you pair it with coffee, the taste of this delicious Italian biscuit is really enhanced. Coffee brings out the full nutty flavor of Italy’s favorite biscuit. If you are a dunker, note that the dry and crisp nature of biscotti is such that it will not fall apart in your mug. The cookie will absorb plenty of coffee and still be intact as you raise it to your mouth. The few crumbs that do end up in the bottom of your mug are like the prize in the bottom of the Cracker Jack box. You’ll love them. We are fully on board with biscotti as the best cookie to pair with coffee. If you agree, we have good news for you: you can order biscotti from Galaxie Coffee. We carry it along with literally hundreds of items in our coffee and break room inventory. Ask about it when you place your next order. Galaxie Coffee has been serving the greater New York area with outstanding beverage and break room service for years. We can supply any office, regardless of size or industry, with the right products at the right prices. Is There an Art to Drinking Black Coffee? If you are like most of us, you know many people who drink coffee black. That person might tell you that his or her preference for black coffee is an acquired taste, as though drinking coffee without cream and sugar is like drinking the finest wines from the Bordeaux region of France. But do not be fooled. There is an art to drinking black coffee without being overcome by the bitterness. The first thing to note is that black coffee does have a very unique flavor. If you can get past the bitterness, the flavor is unlike anything else you’ve ever tasted. You will experience something truly different that is unmasked by cream and sugar. And by the way, that’s the real point of learning the art of drinking black coffee. The idea behind adding cream and sugar is to cover the bitterness coffee naturally presents. But in so doing, you are also masking the good part of coffee’s flavor. So a big part of the art of drinking coffee black is to find a way around the bitterness without masking what you like about the flavor. It is all about enhancing the good flavors. You need to be patient and give yourself a chance to get used to the taste. After a short period of time, you’ll begin to taste and enjoy the different nuances of each type of coffee. 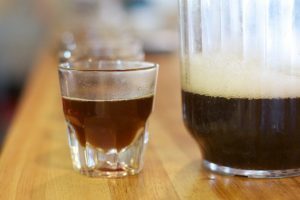 You may wonder what all the hype about cold brew coffee is. Well, it’s not just a millennial thing. Cold brew coffee is decidedly less bitter. It is even somewhat sweet. As a result, there are people who enjoy it without any additives whatsoever. You get all the flavor and benefits of coffee without the extra cream and sugar. And yes, you can heat cold brew up in the microwave without increasing the bitterness. On the other side of the coin, do not try to make hot coffee and then put it in the refrigerator expecting the bitterness to go away. This actually increases its bitterness. 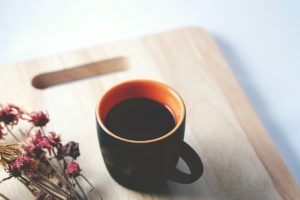 Hot brewed coffee is bitter because the hot water brings out the bitterness of the coffee beans along with the oils that give coffee its flavor. As a side note, a big part of the art of drinking black coffee is to sip slowly. Big gulps only make a bitter brew seem more bitter. Instead, take slow sips and savor the flavor. Let it roll around the tongue to touch the entire pallet. That is where the good flavors are discovered. How Big Does My Office Need to Be to Have Coffee Service? Providing employees with professional coffee service is a great way to show them how much you appreciate their hard work and loyalty. This is just as true for small companies as it is for large ones. You might be wondering if your office is large enough to warrant professional coffee service. We aim to answer that in this post. First and foremost, no office is too small for professional coffee service. Office coffee solutions can always be tailored to the size of the organization, whether there are 25 employees or a couple of hundred. Even offices with fewer than 10 employees may want professional coffee service to accommodate frequent guests or meetings. The key here is to let the office coffee professional size the solution to the specific needs of your organization. Let’s say your office is fairly small. We would recommend a thermal carafe brewer that keeps coffee hot for several hours. If your office wants to brew individual cups of coffee instead, there are multiple options for that. You are familiar with that old phrase many of our parents told us we were young: you’ll never know if you don’t try. Well, something similar applies here. You will never know if your office is large enough for a coffee service if you don’t look into it. Don’t merely assume that coffee service would be too expensive or too wasteful for your office. Instead, give us the opportunity to earn your business. If you are already buying coffee and other break room supplies, give Galaxie Coffee an opportunity to see if we could offer you a comparable solution. Perhaps we could not only relieve your staff of the responsibility of having to run to the store, but also save you money at the same time. We will give you the best possible pricing we can on all the coffee and break room supplies you’re already buying. One way or the other, you’ll be able to choose the option that gives you the best value. Note that the service we provide goes above and beyond coffee pots and hot coffee. In terms of equipment, we have a complete inventory of machines ranging from traditional pour-over machines to the latest single-cup brewers. We also offer water coolers too. In terms of product, our inventory continues to grow to meet the needs of our clients. We offer hot and cold coffees, teas, water, soda, snacks, condiments, paper products, and more. Everything you need to fully stock your break room or coffee cupboard is available through Galaxie Coffee. Eco-friendly break room products are our specialty! We invite you to contact us to learn more about how we can serve your office with professional coffee service. Why not leverage what you are already purchasing for your office as a means to motivate us to want to serve you the best we can? 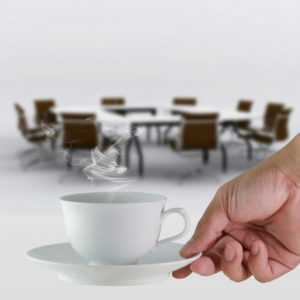 Choose us as your office coffee and break room supplier, and we will do just that. It happens every day in the American office: your employees start feeling their stomachs rumble right about mid- morning, and then again between two and three in the afternoon. That’s when the munchies strike. And what do they do? They head for the break room or the vending machines. Here at Galaxie Coffee, we are all about stocking the break room with the kind of snacks people want. Today, snacking is about making healthier choices. There is plenty of room for the sodas, chips, and candy bars we’ve eaten for generations. However, there is also a growing demand for healthier alternatives. People want to move beyond the high sugar, high calorie snacks to a more healthful way of eating. We get that. Fresh Fruit – Today’s workers are turning to fresh fruit more than they ever have in the past. They are looking for things like apples, bananas, blueberries, and strawberries. Nuts – Nuts are a big hit when the munchies strike. Think almonds, cashews, and even mixed nuts. Moreover, nuts are healthy for you. Bars – We would have just said granola bars in the old days, but granola isn’t the only game in town. There are also fiber bars, chewy trail mix bars, and other options from brands like Kind, Kashi, Clif, and Nature Valley. If you’re interested to see just how many options there are, take a look at our website. We have an entire product category devoted to healthy snacks. Thanks to the splendid work done by nutritionists, we now know how important portion control is to healthy eating. But don’t let a focus on portion control influence your decision to purchase healthy snacks for your breakroom. You can buy in bulk to save money, then utilize dispensers for portion control purposes. A lot of our customers address break room snacking this way. Here’s what you need to know: if there is a way to stock your break room with snacks and beverages that will help your employees make healthier choices, we likely have a way to make it happen. It is what we do. Galaxie Coffee has been in the business of stocking New York’s break rooms for years. We have the resources to create a custom solution perfect for your business. The munchies are going to strike your office at least twice today. 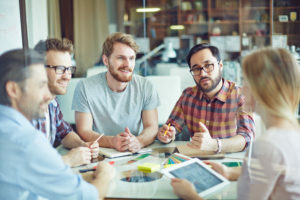 What are your employees going to do? Are they going to head for a couple of vending machines filled with candy bars and chips, or will they had to a break room where they will find healthier choices? That is up to you. Just promise that you will get in touch with us if we can help. Who Is More Particular: The Coffee or Tea Drinker? Coffee and tea are like two heavyweights duking it out in the hot beverage ring. But this is one fight that will never be won by knockout. The winner will be determined by a vote of the judges which, it just so happens, are consumers. So who is more particular, coffee or tea drinkers? The answer depends on who you ask. Your average coffee drinker will say he/she is far more particular than a tea drinker. The average tea drinker would respond with his/her firmly held belief that his/her comrades are much more discerning – which is why they drink tea to begin with. Determining how particular consumers are based on consumption volume is a virtual draw. Data published by Indy 100 in 2016 shows the world pretty evenly split. 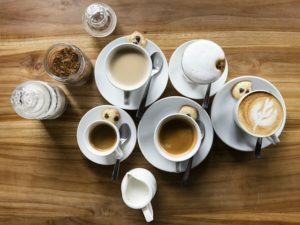 Coffee is preferred throughout the Western Hemisphere as well as Western Europe – with the exception of England – while tea is the preferred drink in Eastern Europe, Asia, and Africa. Consumption volume alone does not tell us much about which kind of drinker is more fussy. So let us move on to other measurements: the number of choices and public opinion. If we measure the particularness of hot beverage drinkers based on the number of choices in the marketplace, coffee would win hands down. Just go into any urban coffee shop and have a look at the menu. You will find straight black coffee, decaf coffee, and dozens of different lattes, frappes, espresso drinks, and so forth. Even more amazing is the fact that you can have five coffee shops within a few blocks that all have different menus. This isn’t to say that tea only comes in one flavor; it does not. However, it is rare to see tea drinkers be so specific about what they put in their tea. Coffee drinkers obsess over creamers, syrups, and other additives. If the local barista doesn’t get the flavor combination just right, there could be hell to pay. Author Margaret River makes the case that tea drinkers who are not particular about what they get in a restaurant should start being fussier. She makes the case that they should begin demanding as much quality and variety as their coffee-drinking counterparts. In the end, whether you are particular about your coffee or tea is entirely your prerogative. Our goal at Galaxie Coffee is to make sure you have just what you want in your break room or office. If you have ever considered coffee service for your staff, please give us a call. We would be happy to explain how our service works and how you and your organization can benefit from it.